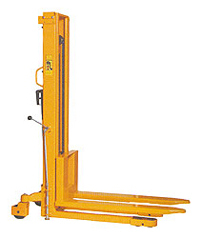 Our range of manual stackers is easily the widest and most comprehensive available. One Stop Handling supply and service Manual Stackers in Dublin and throughout Ireland. Standard issue hydraulically operated hand pump handle to raise the forks and hand lever to lower forks are very simple to use and will make light work of any pallet. Our manual stackers are moveable under load and are very easily manoeuvred in keeping with the user friendly and versatile nature of our wide range of pallet stackers. All our manual stackers come with heavy duty c section mast. Lift heights from 1500mm up to 3000mm and all with 1 ton capacity as standard. Standard issue wrap over forks will work with euro and imperial pallets alike but if you have closed bottom or oversized pallets you have come to the right place as our comprehensive range of wide straddle stackers are just as versatile and user friendly as our range of standard pallet stackers. 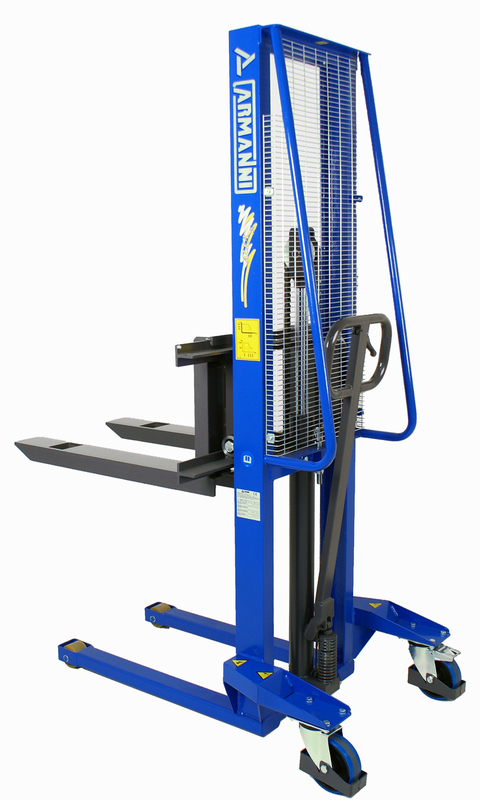 All of our manual stackers are available with single or tandem load wheels as well as the addition of nylon or polyurethane wheels depending on your individual requirements. Our manual stackers are available in mild steel as well as galvanised and full stainless steel for cleanroom applications. As always safety is our paramount concern and our manual stackers come with hand operated brakes and steer wheel foot guards as well as full guarding on the mast to ensure the safety of both your palletised goods and your staff. All of our manually propelled stackers are manufactured using the highest quality material and parts. They all have a capacity of 100Kg @ 600mm load centres. There are various options of lift heights (see table). All models are easily manoeuverable using the standard pulling handle.